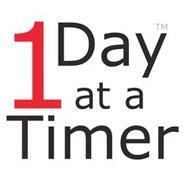 The One Day at a Timer is a unique smartphone application which runs on the iPhone, iPod touch and iPad. This life changing application is written and marketed by 1017 Visual Effects Inc. which is based in Toronto, Canada. 1017 designs, produces and markets useful tools worldwide to anyone who wants to use them. If you are interested in photography then visit www.pclix.com for more information about another of our innovative designs. Enjoy. Thanks to: Dave Cormack, Norm Lehman, Trish Hennessy, Mike Johnson, Janet Fraser, Bruce Sidlinger, Ken Ashe, Joanne Cormack, Brandon Van Fleet and Catherine Comuzzi.